The previous twelve months have culminated in our debut appearance at the London Stationery Show, a show exclusively for trade buyers. As a celebration of our first time at the Islington-based event, we’ve partnered with Paul Antonio, expert calligrapher for an Inktense workshop, showing savvy retail experts how to great creative with our watersoluble medium. Not only is Paul a fantastic artist, he is a trained calligrapher, gilder and heraldic artist as well as an expert in manuscript history and archaeological illustration. His talent stretches across the globe and he has written hieroglyphs out in Egypt for the Metropolitan Museum of Art and is one of four specially selected Crown Office scribes, who write out British law on vellum with traditional quills. We asked a busy Paul a few questions ahead of the show. There’ll be a lot of people who want to do calligraphy, following an increased interest in the craft. However most people don’t know where to begin! What do you suggest is best place to start if someone would like to start? Decide on the script you want to learn from. Calligraphy today encompasses more different ways to write than ten years ago. If you know what you want to learn, you can choose your tools to fit your style! Once you have an exemplar and you are ready to write, do some online searching to see how other people write. The most important thing to remember is, at NO POINT should you ever be in pain. If you are suffering, you are doing something wrong. Don’t grip the writing tool so hard, sit up don’t slouch, take a break. Why do you enjoy using Inktense Pencils for calligraphy artwork? I love the fact that Inktense are so versatile and that the colours are so intense. They give the perfect solution as an ink in a solid form, which makes them easier to carry around than a huge pot of ink. You can use them as a pencil or as ink and that makes good sense for both travel journal illustration or bullet journalising as well as when needed as a vibrant ink wash.
How do you use Inktense for calligraphy? How does it differ from using traditional tools? It is a completely different approach! When we start learning calligraphy, we are taught using double pencils. I immediately saw the application of using a pencil instead of a dip pen. However, having a strong knowledge of other traditions of calligraphy internationally gave me a little more insight into how to make applying Inktense work well. Unlike a dip pen, where you dip the nib in the ink, you can use Inktense to either write with the pencil and flood the area with water, or wet the pencil and write with that directly. The latter gives you the option to create some great mark variations based on the intensity of the shades, the blending opportunities and the ability to create gradients. Is the colour and intensity of colour a key factor when creating artwork? It’s not important if you’re wanting to create prints, as you may want to keep the background clear for copying. But, if you are making one off pieces, that is a completely different matter. Inktense offers a really vivid colour interaction and they are incredibly fun to use. I feel you have a little more control over where the colour goes, and if you stress out about watercolour blending and getting colour EVERYWHERE, then Inktense are you – due to the fact they dry permanently once they’re set! That is not to say you can’t treat Inktense like a watercolour if you don’t want. My advice would just be to experiment and play – because the colours really encourage you to do exactly that! Give us your top three tips when working with Inktense on calligraphy projects? No matter if you have to get up or think you haven’t finished – ALWAYS DRY THE TIPS, never leave them to soak in water. Plan your colours and know roughly where you want them – there’s no need to be pinpoint meticulous! But once wet, don’t be afraid to go back in there with the pencil and get more intense pigment deposition. If you are going to write on top if it with ink from a pen, use a tester sheet first as it may need setting – either with heat or a sealant. What other Derwent materials do you use? I’ve always loved Derwent pencils from the time I stumbled across them during my time at Art School nearly 20years ago. The range of pencils is staggering and the range of colours is absolutely joyous. Derwent really are experts in the way they group them together and how they can all intermix. The sheer variety of pencils alone is a lot to get through! However, I’m particularly fond of Derwent Inktense Blocks as they make superb writing tools. I often partner them with a waterbrush and have even broken up some of the Inktense Blocks to drop them into the reservoir directly! 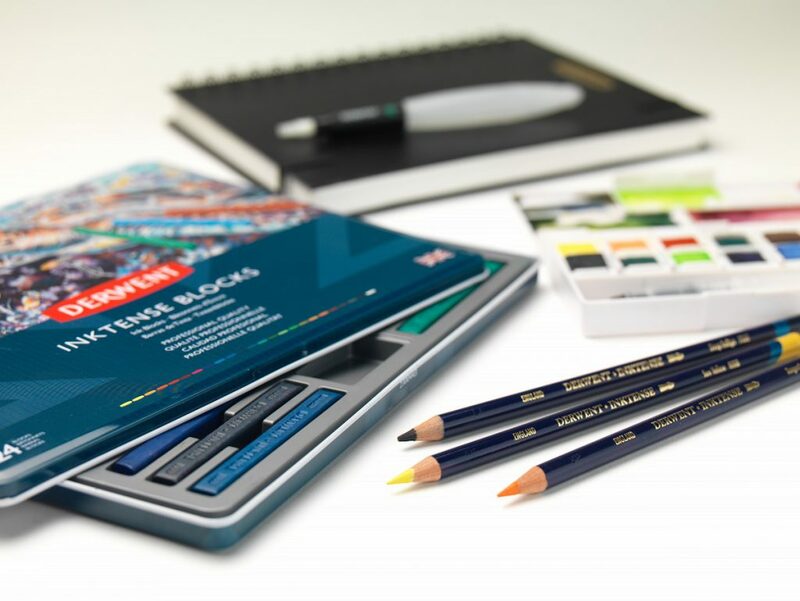 Derwent Graphic should be a staple of every pencil case – the gradations of hardnesses make for a better experience. The Tinted Charcoal makes for a super underpainting. Safe to say, I can’t just pick one! I also love Derwent’s accessories too – pencil extenders, battery operated erasers, spritzers – but give me shaped erasers and I’m a happy calligrapher! And finally, are you looking forward to showing buyers at the London Stationery Show how to explore the possibilities of Derwent Inktense Pencils? I think showing retailers is really important! If you walk into an art store, you want to know that the staff know what the tools can do, how far you can push them and how much fun you can have with them. So in that respect, it is really fulfilling to get retailers working with tools directly and being guided by a professional. Ultimately, it makes for a better experience for the customers. Paul Antonio is an expert calligraphy and hand lettering artist. His Facebook, Twitter and Instagram are full of fantastic images. Paul will be demonstrating the Inktense Pencils at the London Stationery Show on Wed, 25th April (from 14.00).